Learning to make whisky ~ what could be better? Whisky for Girls wereluckyenough to be sponsored by Mr Jim McEwan for a week of Whisky Academy at Bruichladdich Distillery, with the Progressive Hebridean Distillers themselves. Luckily, whisky is made every week, so without further ado, I was kitted out with steel toe cap shoes, told where the tea and biscuits wereand pointed in the direction of the mash tun. Bruichladdich mash tun is open topped so they put through 4 waters as there will be more evaporation than in a covered mash tun. This mash tun was built in 1881 and is made from cast iron. 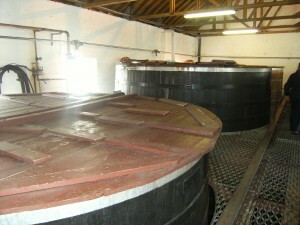 Many of the distilleries now are putting in stainless steel mash tuns. 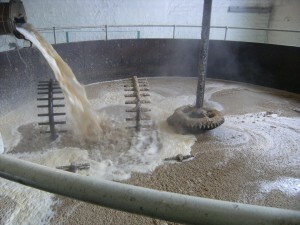 What is happening in the mashing, is that the enzymes in the barley which developed during the malting process will, when heated in the water of the mash, react with the starches in the malt and produce maltose ~ a sugar. The first three water put through here are for mashing, and the fourth water is for ‘sparging’, which means it is to wash out all the sugars from the malted barley. When this sugary water is drained off it is called ‘wort’. This is the product we want when making whisky. It’s the liquid we need. The washed out barley is called ‘draff’ and the farmers feed it to the beasts. A very interesting point here, is that the mash man Graham checks for the stages of the mashing by listening. He listens for the change in the sound of the screw delivering the grist to join with the water to fill the initial mash. He listens to the change in sound when he thumps the grist bin so he knows how full it still is. He listens for the mill and is aware of all the sounds that tell him how things are progressing. In this age of computers, it was very refreshing to find this common sense way of working. The wort is cooled to around 20 degrees C then the yeast is added. Some yeasts can reproduce up to twenty times in well -areated wort. Brewer’s yeast tends to be more prone to foaming, creating the lively head often seen in washbacks. In the past this ‘foaming’ was controlled by beating the head of foam with wooden sticks. Now it is more likey to be by mechanical switchers reminiscent of windscreen wiper blades. In Bruichladdich the fermentation time is 60-80 hours (105 over the weekend). 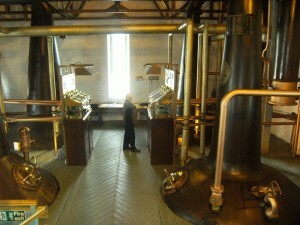 Next stage on my learning process was into the still house with PG. I made Bruichladdich Organic! I turned valves, ran up and down stairs, checked strength of the spirit, turned more valves, checked pressure gauges ~ you name it! It was like working in a space ship. I used to think that the stillmen had an easy job………. Nowadays, much of the stillman’s responsiblity has been taken from him by computers. 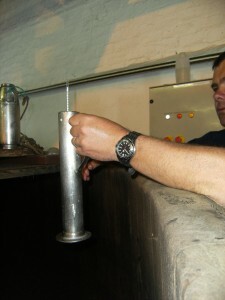 The computer gauges the strength of theliquid and decides when the spout will swing over and make the cut for spirit. Not so in Bruichladdich. You have to keep your eye on the job ~ even teabreaks are taken in the still house! PARTII of THE BRUICHLADDICH SINGLE MALT ACADEMY report will follow in the next couple of days…… stay tuned!